“Batista goes in there and then all hell breaks lose,” Gibbons recalled with a smile Thursday, hours before the Blue Jays retired Halladay’s No. 32 in an emotional pre-game ceremony to kick off their new season. “I think the game ended with a smoking line drive to centre field, we caught it but the go-ahead run was on base. We got out of it and we’re shaking hands and I said to Roy: ‘I’ll never do that again, trust me,’ and if I remember correctly he just said: ‘Don’t worry about it.’ But I learned my lesson. 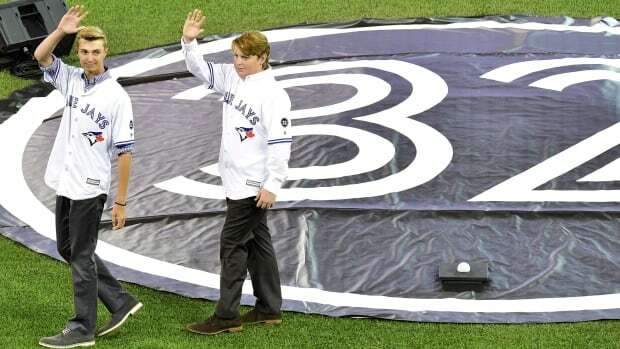 The club returned the favour Thursday, enshrining him on the Rogers Centre’s Level of Excellence and unfurling a No. 32 banner from the centre-fielder rafters to thunderous applause. Gibbons presented Halladay’s sons with a gift from the organization before a video tribute was shows on the centre-field scoreboard. Halladay’s number is only the second to be retired by the Blue Jays. Hall of Famer Roberto Alomar’s No. 12 was retired in 2011. All Toronto players will wear a commemorative No. 32 patch on the left sleeve of their uniforms this season. “I remember thinking that no-hitter was incredible,” new Toronto reliever and Canadian John Axford said last week. “Being a Blue Jays fan, seeing how hard he worked, and this team wasn’t able to have the playoffs come to fruition for him. So I remember that moment [the no-hitter] and being so happy for him. “He wasn’t afraid of anybody, and he wasn’t a guy that I would want to face, that’s for sure,” added Blue Jays second baseman Devon Travis. “It just shows that this life, every single day you better appreciate it.